The culture of striped catfish (Pangasianodon hypophthalmus) has developed rapidly in the Mekong Delta of Viet Nam over the past few decades, particularly in the provinces of An Giang and Dong Thap (Phan et al. 2009). Improved methods for fry production in hatcheries and grow-out in ponds have led to a significant increase in yield per pond, enhancing the socio-economic status of Vietnamese producers (Dung et al. 2008; Phuong and Oanh, 2009). However, the intensification and increased commercialization of aquaculture production poses many challenges, including the management of diseases (Subasinghe, 2003). Fungal infections of the fry and eggs of many freshwater fish are common (Bangyeekhun et al. 2001; Fregeneda-Grandes et al. 2007; Kwanprasert et al. 2007; Thoen et al. 2011; Abking et al. 2012). Fungal infections are usually considered to be secondary infections in aquatic animals, arising in part due to other healthrelated problems (Yanong et al. 2003). The most common fungal infections in fish eggs are caused by members of the genera Saprolegnia and Achlya of the family Saprolegniaceae (Yanong et al. 2003; Chukanhom and Hatai, 2004). During incubation, fungal mycelia usually develop initially in unfertilized eggs and then spread to healthy eggs, causing high mortality and significant losses (Mousavi, 2009). Like other fish species, striped catfish are susceptible to infection by parasites and bacterial and fungal pathogens (Dung et al.2008; Faruk, 2008). Gram-negative bacteria such as Edwardsiella ictaluri and Aeromonas hydrophila have been reported as causative agents of serious diseases in farmed striped catfish (Crumlish et al.2002; Ho et al. 2008; Dung et al. 2012). Water molds have also been isolated from farmed fish and fish eggs in Viet Nam (Tuan and Duc, 2010); however, there are no published reports of fungal infections of striped catfish eggs and fry in Viet Nam. In this study, we isolated and identified the fungi of infected eggs and fry of striped catfish in the An Giang and Dong Thap Provinces of Viet Nam. In addition, we examined the effects of temperature and salinity on the growth of the fungal isolates and the pathogenicity of the zoospores against hatching eggs. A total of 30 each of eggs and fry with cotton-like mycelia on the surface were collected at two hatcheries in An Giang Province and three hatcheries in Dong Thap Province in the Mekong Delta of Viet Nam. The eggs and fry were taken to the Mycopathology Laboratory, College of Aquaculture and Fisheries, Can Tho University. In the laboratory, the egg and fry specimens were first observed under a microscope if fungal hyphae were present (Figure 1). 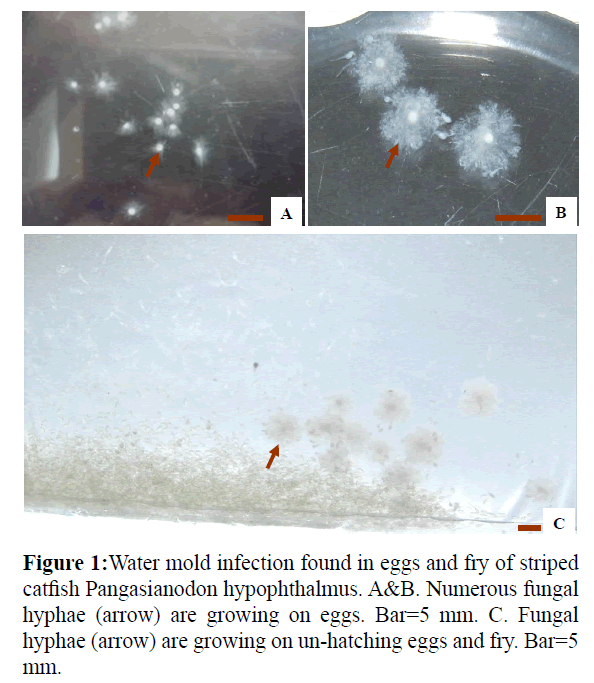 Figure 1: Water mold infection found in eggs and fry of striped catfish Pangasianodon hypophthalmus. A&B. Numerous fungal hyphae (arrow) are growing on eggs. Bar=5 mm. C. Fungal hyphae (arrow) are growing on un-hatching eggs and fry. Bar=5 mm. Infected eggs and fry were washed with sterile tap water and inoculated onto GY agar containing 1% glucose, 0.25% yeast extract, and 1.5% agar (Hatai and Egusa, 1979). Ampicillin and streptomycin sulfate (each 500 μg mL−1) were added to the medium before autoclaving to inhibit bacterial growth. The plates were incubated at 28°C for 1-4 days. Colonies appearing on the GY agar were sub-cultured on fresh agar plates, and pure cultures were prepared using the single-spore culture method (Ho and Ko, 1997; Hatai et al.2000). For morphologic observations, the edge of a fungal colony was excised as an agar block and inoculated into 50 mL of GY broth (Hatai and Egusa, 1979). After incubation at 28°C for 4 days, growing hyphae were removed, washed three times with sterile tap water, and inoculated into sterile tap water and incubated at 28°C for 12-20 h for zoospore production. Fungal isolates were identified based on the pattern of zoospore production (Coker and Matthews, 1937; Johnson, 1956; Seymour, 1970). The strains identified in this study were named according to their original designation in culture collections. Four fungal strains isolated from infected eggs and fry were selected randomly (AG1213, DT1218, AG1219 and DT1221) for analysis. Using a No. 2 cork borer, agar blocks (5.5 mm in diameter) were cut from the edge of a growing colony of each strain and placed onto the center of a 90-mm plastic Petri dish containing GY agar. The plates were incubated at 20, 25, 30, 35, and 40°C. The diameter of the colony on each plate was measured every 3 days using a Vernier caliper. The experiment was replicated three times. Agar blocks (5.5 mm in diameter) of the same four fungal strains were placed onto the center of GY agar plates containing 0, 1, 2, 3, or 4% NaCl. The plates were incubated at 30°C. The diameter of the fungal colony on each plate was measured every 3 days. The experiment was replicated three times. Two isolates from striped catfish eggs, Achlya sp. AG1213 and Saprolegnia sp. AG1219, were chosen for experimental infection assays. Agar blocks of each fungal strain were placed into Petri dishes containing 20 mL of GY broth and incubated at 28°C for 3 days. The fungal mycelia were then washed five times with sterile tap water and cultured in 30 mL of sterile tap water at 28°C for 18-24 h for zoospore production. The concentration of fungal zoospores was determined using a blood counting chamber. Suspensions containing 1 × 102 and 1 × 103 zoospores mL−1 of each strain were prepared in sterile tap water. Sterile tap water was used to challenge control eggs. A total of 50 fertilized striped catfish eggs were used for each group. The experiment was replicated three times. Experimental challenges were conducted at room temperature in the hatching room. The growth of fungal hyphae on the surface of eggs was observed under a microscope. Hyphae were isolated from infected eggs in order to confirm that the fungus was the same strain used in the challenge. Finally, the hatching rate of the eggs was calculated. The eggs of striped catfish infected with water molds (Figure 1) were covered with numerous cotton-like mycelia (Figure 1). A total of 85 and 20 fungal strains were isolated from the eggs and fry of striped catfish, respectively. Among these isolates, 90 strains were identified as Achlya spp., and 15 strains were identified as Saprolegnia spp., based on asexual reproduction characteristics. Isolate AG1213 grew rapidly on GY agar, with an average growth rate of 17.3 mm per day at 30°C. Colonies were puffy and whitish on GY agar (Figure 2A). Hyphae were aseptate and branched (Figure 2C). Zoospore formation was observed at 13 h when mycelia were cultured in sterile tap water at 28°C (Figures 2B and 2C). The zoospores were discharged from the end of the zoosporangium and formed a cluster at the tip. Zoospore production was achlyoid type. Secondary zoospores germinated 24 hr after they encysted (Figure 2D). Based on these data and asexual reproduction characteristics, the strain was identified as a water mold of the genus Achlya. Figure 2: The morphological characteristics of Achlya sp. AG1213: A. Colony on GY agar incubated at 28oC for 3 days. Bar=10 mm. B. Zoosporangium with zoospores (arrow). Bar=5 μm. C. The primary zoospores discharged from the end of the zoosporangium and formed a cluster at the tip (head arrow) and hyphae (arrow). Bar=5 μm. D. Secondary zoospores encysted after swimming and germinated (arrow). Bar=10 μm. Isolate AG1219 grew rapidly on GY agar, with an average colony diameter of 75 mm when incubated at 30°C for 3 days (Figure 3A). Fungal hyphae were aseptate and branched. Zoospore formation (Figure 3B) was observed 18-20 h when the hyphae were incubated in sterile tap water at 28°C, after which the zoospores swam away from the tip of the zoosporangium. Zoospore production was saprolegnoid (Figure 3C). Secondary zoospores germinated 26 h after they encysted (Figure 3D). Based on these data and asexual reproduction characteristics, the strain was identified as a water mold of the genus Saprolegnia. Figure 3: The morphological characteristics of Saprolegnia sp. AG1219. A. Colony on GY agar incubated at 28°C for 3 days. Bar=10 mm. B. Zoosporangium with zoospores (arrow). Bar=5 μm. C. Primary zoospores swam away into water (arrow). Bar=5 μm. D. Germination from encysted zoospore (arrow). Bar=10 μm. The effect of temperature on the diameter of colonies of the four isolates examined in this study is shown in Table 1. Isolates (AG1213 and DT1218) of the genus Achlya and isolates (AG1219 and DT1221) of the genus Saprolegnia exhibited slow growth at <20 and >35°C and rapid growth at 25-30°C. The optimum temperature for the growth of the Achlya and Saprolegnia isolates was 30 and 25°C, respectively. None of the isolates grew at 40°C. Colony diameter was measured 3 days after inoculation. Table 1: Effect of temperature on mycelial growth on GY agar. Table 2 shows the diameter of colonies of the four isolates grown on GY agar containing different concentrations of NaCl. The Achlya isolates (AG1213 and DT1218) and Saprolegnia isolates (AG1219 and DT1221) grew slowly on GY agar containing 1% NaCl, and no mycelial growth was observed on GY agar containing 2% NaCl. All four isolates grew on GY agar containing up to 1% NaCl. Table 2: Effect of sodium chloride (NaCl) on mycelial growth on GY agar. 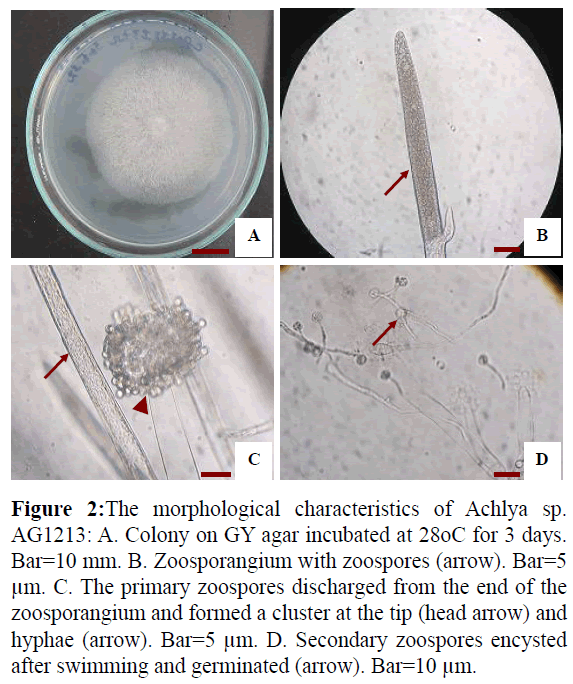 Striped catfish eggs were experimentally infected with zoospores of Achlya sp. AG1213 and Saprolegnia sp. AG1219. The hatching rate differed according to the number of zoospores used for the challenge (Figure 4). Eggs that did not hatch were recorded as infected with the fungus. 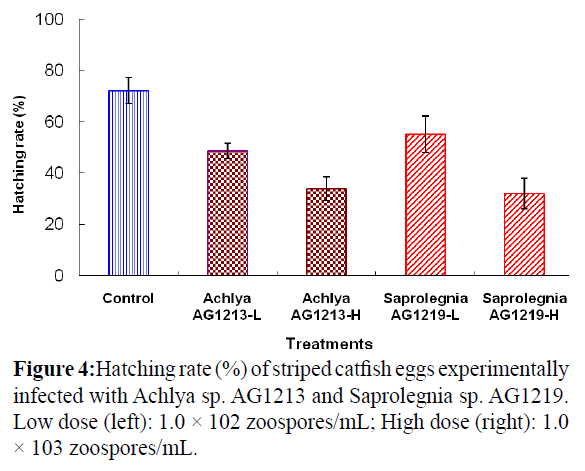 Figure 4: Hatching rate (%) of striped catfish eggs experimentally infected with Achlya sp. AG1213 and Saprolegnia sp. AG1219. Low dose (left): 1.0 × 102 zoospores/mL; High dose (right): 1.0 × 103 zoospores/mL. The surface of infected eggs was covered with cotton-like hyphae after 18 h; however, no evidence of fungal infection was observed on eggs in the control group. The hatching rate of eggs challenged with low and high doses of Achlya sp. AG1213 zoospores was 48.7 and 34.0%, respectively. The hatching rate of eggs challenged with low and high doses of Saprolegnia sp. AG1219 zoospores was 55.3 and 32.0%, respectively. The hatching rate of the Saprolegnia control group was 72.3%. Some species of the genera Saprolegnia and Achlya are known pathogens of freshwater and brackish-water fishes (Yanong, 2003). The typical clinical signs of infection are the presence of cottonlike white masses on the skin or gills. These masses initially affect only small areas of the fish, but the lesions spread rapidly and eventually may cover most of the fish’s body (Yanong, 2003). Achlya ambisexualis has been isolated from the eggs and fry of tilapia (Oreochromis niloticus) (Panchai et al. 2007), whereas Saprolegnia diclina has been isolated from pejerrey (Odonthetes bonariensis) (Kitancharoen et al. 1995). In addition, A. klebsiana and S. diclina have been isolated from the eggs of common carp (Cyprinus carpio) (Chukanhom and Hatai, 2004). In the current study, water molds of the genera Saprolegnia and Achlya were isolated from eggs and fry of striped catfish infected with the fungi in Dong Thap Province, Viet Nam. However, to date, no reports of infection of striped catfish eggs and fry by these fungi have been published. This is thus the first report describing infection of striped catfish eggs and fry by members of the genera Achlya and Saprolegnia. The optimum temperature for the growth of Achlya spp. and Saprolegnia spp. examined in this study was 30 and 25°C, respectively, similar to previous reports regarding the optimum growth temperature of S. diclina (25-30°C), A. klebsiana (30-35°C), and A. bisexualis (20-30°C) (Klinger and Francis-Floyd, 1996; Chukanhom and Hatai, 2004; Panchai et al.2007; Abking et al. 2008). The optimum growth temperature results of the present study suggest that the isolated fungi were adapted to tropical conditions. Both Achlya spp. (AG1213 and AG1218) and Saprolegnia spp. (AG1219 and AG1221) isolates grew on GY agar containing up to 1% NaCl, but no growth was observed for any of the isolates on GY agar containing 2% NaCl. These results differ from those reported for A. bisexualis isolated from the eggs of Nile tilapia (Panchai et al. 2007) and giant catfish (Pangasianodon gigas) (Abking et al. 2008) and differ also from results reported for S. diclina isolated from the eggs of common carp (Chukanhom and Hatai, 2004) and giant catfish (Abking et al. 2012), all of which could tolerate up to 1.5% NaCl. Our results indicate that the Achlya and Saprolegnia isolates examined in the present study can grow only in freshwater environments and cannot survive in seawater. The eggs of striped catfish could be experimentally infected with Achlya sp. AG1213 and Saprolegnia sp. AG1219. The clinical signs were similar to those of eggs of striped catfish naturally infected with these fungi. Fungal hyphae were observed microscopically in wet-mounts of the eggs, and fungi of the same genera were re-isolated from the experimentally infected eggs. No fungal hyphae were observed on eggs of the control group, and no fungi could be isolated from control eggs. These results demonstrate that Achlya sp. AG1213 and Saprolegnia sp. AG1219 are pathogenic to unhatched eggs of striped catfish. These results are similar to those reported by Abking et al. (2012), with the exception that the hatching rate of Saprolegnia-infected eggs of giant catfish was lower than that of striped catfish as reported here. This study is the first report of pathogenic water molds isolated from eggs and fry of infected striped catfish in the Mekong Delta of Viet Nam. This work was financially supported by Vietnam’s National Foundation for Science and Technology Development (NAFOSTED), Grant No. 106.99-2011.56. I would like to thank Vietnam’s National Foundation for Science and Technology Development affiliated with the Ministry of Science and Technology for financial support this study and give the opportunity to me to do research proposal on a studies on fungal infection in striped catfish (Pangasianodon hypophthalmus) and cultured water environment. Abking N., W. Fuangsawat and O. Lawhavinit (2012): Achlya spp. isolated from eggs of the Mekong giant catfish (Pangasianodongigas, Chevey). Proceedings of 47th Kasetsart University Annual Conference Veterinary medicine Bangkok, pp. 187-196. Bangyeekhun, E., S. M. A. Quiniou, J. E. Bly and L. Cerenius (2001): Characterisation of Saprolegnia sp. isolates from channel catfish. Dis. Aquat. Org., 45, 53-59. Chukanhom, K. and K. Hatai (2004): Freshwater fungi isolated from eggs of the common carp (Cyprinuscarpio) in Thailand. Mycoscience,45, 42-48. Coker, W. C. and V. D. Matthews (1937): Blastocladiales, Monoblepharidales, Saprolegniales. North. Am. Flora, 2 (1), 1-76. Crumlish, M., T.T. Dung, J.F. Turnbull, N.T.N. Ngoc and H.W. Ferguson (2002): Identification of Edwardsiellaictaluri from diseased freshwater catfish, Pangasiushypophthalmus (Sauvage), cultured in the Mekong Delta, Vietnam. Journal of Fish Diseases,25, 733-736. Dung, T. T., K. Chiers, N. A. Tuan, P. Sorgeloos, F. Haesebrouck and A. Decostere (2012): Early interactions of Edwardsiellaictaluri, with Pangasianodon catfish and its invasive ability in cell lines. Vet Res Commun, 36, 119-127. Dung, T. T., N. T. N. Ngoc, N. Q. Thinh, D. T. M. Thy, N. A. Tuan, A. Shinn and M. Crumlish (2008): Common diseases of Pangasiuscatfish farmed in Vietnam. Global Aquaculture Advocate, 77-78. Faruk, Md. A.R. (2008): Disease and health management of farmed exotic catfish Pangasiushypophthalmus in Mymensigh district of Bangladesh, pp. 193-204. In Bondad-Reantaso, M.G.., Mohan, C.V., Crumlish, M. and Subasinghe, R.P. (eds). Diseases in Asian Aquaculture VI.Fish Health Section, Asian Fisheries Society, Manila, Philippines. 505p. Fregeneda-Grandes, J. M., F. Rodriguez-Cadenas and J. M. Aller-Gancedo (2007): Fungi isolated from cultured eggs, alevins and broodfish of brown trout in a hatchery affected by saprolegniosis. Journal of Fish Biology, 71, 510-518. Hatai K. and S. Egusa (1979): Studies on the pathogenic fungus of mycoticgranulomatosis-III. Development of the medium for MG-fungus.Fish Pathol.,13, 147-152. Hatai, K., D. Roza and T. Nakayama (2000): Identification of lower fungi isolated from larvae of mangrove crab, Scylla serrata, in Indonesia. Mycoscience, 41, 565-572. Ho, T.T., N. Areechon, P. Srisapoome and S. Mahasawasde (2008): Identification and antibiotic sensitivity test of the bacteria isolated from Tra catfish (Pangasianodonhypophthalmus) cultured in pond in Vietnam. Kasetsart J. (Nat. Sci. ),42, 54-60. Johnson, T. W. (1956): The genus Achlya morphology and taxonomy. The University of Michigan Press.180 p.
Kitancharoen, N., K. Hatai, R. Ogihara and D. N. N. Aye (1995): A new record of Achlyaklebsiana from snakehead, Channastriatus, with fungal infection in Myanmar. Mycoscience, 36, 235-238. Kwanprasert, P., C. Hanjavanit and N. Kitancharoen (2007): Characteristics of Achlyabisexualis Isolated from Eggs of NileTilapia (Oreochromisniloticus Linn.). KKU Res. J.,12 (3), 195-202. Mousavi, H. A. E., M. Soltani, A. Khasravi, S. M. Mood and M. Hosseinifard (2009): Isolation and characterization of Saprolegniaceae from rainbow trout Oncorhynchusmykiss eggs in Iran. J. Fish. Aquat. Sci., 4 (6), 330-333. Panchai K., C. Hanjavanit and N. Kitacharoen (2007): Characteristics of Achlyabisexualis isolated from eggs of Nile tilapia (Oreochromisniloticus). KKU Research Journal,1, 195-202. Phan, L.T, T.M. Bui, T.T.T. Nguyen, G.J. Gooley, B.A. Ingram, H.V. Nguyen, P.T. Nguyen and S.S. De Silva (2009): Current status of farming practices of striped catfish, Pangasianodonhypophthalmusin the Mekong Delta, Vietnam. Aquaculture,296, 227-236. Phuong, N. T. and D. T. H. Oanh (2009): Striped catfish (Pangasianodonhypophthalmus) aquaculture in Viet Nam: an unprecedented development within a decade. In: De Silva, S.S., Davy, F.B. (Eds. ), Success Stories in Asian Aquaculture. 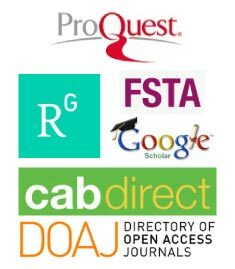 Springer, NACA and IDRC, Dordrecht, Bangkok and Ottawa, pp. 133-149. Seymour, L. (1970): The genus Saprolegnia. Nova Hedwigia,19, 11-24. Subasinghe, R. P., D. Curry, S. E. McGladdery and D. Bartley (2003): Recent technological innovations in aquaculture. Review of the State of World Aquaculture, FAO Fisheries Circular, pp. 59-74. Thoen, E.,O. Evensen, I. Skaar (2011): Pathogenicity of Saprolegniaspp. to Atlantic salmon, SalmosalarL., eggs. Journal of Fish Diseases, 34, 601-608. Tuan, T. N., P. M. Duc (2010): Morphological and biological characteristics of fungi isolated from climbing perch (Anabas testudineus) with “fungal infection”. Journal of science Can Tho University, 15a, 224-231. Yanong, R. P. E. (2003): Fungal diseases of fish. Vet ClinExot Anim.,6, 377-400.